If you're thinking of dying your hair, a hair color chart can be extremely useful in starting the process off right. Whether you're a newbie to the world of hair coloring or want to change your look drastically, you'll benefit from this tool. There are many different ways you can find hair color charts to help you figure out what shade to dye your hair. From salon charts to color guides you can use at home, you'll have no trouble finding the right color for you. When a woman normally thinks of a hair color chart, she typically thinks of the large board with swatches of colored hair samples at the salon. Stylists keep these handy boards on hand to help clients with the color selection process. Whether the hair is being completely colored, highlighted or lowlighted, a chart can make the decision process a bit easier. Color charts feature all of the colors available at the salon. The hair swatches can be easily removed and held against the client's own hair to offer a better idea of how the color will look. Individuals who are coloring their hair for the first time, choosing to alter their look dramatically, or just want something a little bit different from the usual will all benefit from the chart to get an idea about the imminent changes. When you're ready to make a change, consider visiting your stylist and address your desires and concerns. Always keep your budget and the proposed maintenance under consideration. There are plenty of flattering hair colors that work for nearly every skin tone and lifestyle. While a hair color guide can help you pinpoint your desired look, a professional and experienced colorist is your best option for achieving optimal results. The next best thing to a salon chart is an at-home color ring. This is an excellent investment for anyone who colors her hair regularly or frequently uses wigs or extensions. You can purchase color rings at places like Laissez Faire. Many brands of at-home hair color offer their own swatch charts on their official websites and some third-party beauty sites. This is an ideal tool for anyone who knows what brand they want to use. It's also suitable for anyone who is browsing and happens to find a great color in that particular brand's lineup. Wella: The Wella chart system is sorted into categories like Natural, Ash, Gold, Warm, Fashion Red, toners and special products like intensifiers and modifiers. Manic Panic: One of the leaders in unexpected, bold hair color, Manic Panic is renowned for its rich cream hair color. This catalog offers a relatively true-to-life review of what's available, categorized by collection. Clairol Beautiful Collection: These semi-permanent shades are split into two categories, Advanced Gray Solution and Moisturizing Color. Within each category, the colors can be mixed together to achieve custom results. Clairol Texture & Tone: These permanent shades can be mixed together to create just the right color for you. They offer 100 percent gray coverage and there's no ammonia. L'Oreal Feria: Feria's known for its multi-dimensional color results, and the permanent line offers a beautiful selection of natural and vibrant shades. L'Oreal Excellence: The Excellence line is a creamy permanent formula that offers everything from the lightest beige blonde to the deepest black. It's designed to cover all grays and protect hair from damage. Color charts aren't just for hair dye. Anyone who's worn a wig can attest to the tricky task of finding a suitable match. Whether you're looking for something similar to your own hair color or something drastically different, you'll have no trouble narrowing your color selection down with the help of a chart. Check out these wig charts for further information. Revlon: Revlon's wig selection is impressively vast. With so many shades of brunette, red, blonde and gray to choose from, finding the right one can be an exhaustive process. This chart features the color name and number, a small color swatch and a brief description of the shade. Look of Love: Look of Love offers an equally diverse selection of wigs. The site encourages clients to send in a clip of natural hair in order to best match a wig. If you do this, choose a lock of hair that best represents your overall natural hair color. This is usually found on the upper layers and outer ends of the hair (as opposed to, for example, the nape of the neck). If you're thinking of ordering hair extensions, it's best to have at least some idea of the color that will best suit you. This is generally easy enough to do, but it's helpful to have access to a color chart to better determine the most appropriate shade. An extensive chart like the ones available from Vision Hair and Hair Extension Boutique can help make the process easier. Though there are plenty of online color charts available, it's best not to rely on them completely. Color resolution differs from one computer to the next. What looks perfect on one computer might look disappointingly different on another - and still more different in real life. Clearly, online charts are not a guarantee of what the actual shade will look like. An online chart is thus best used as a reference point only. Think of it like makeup - you probably wouldn't order a new foundation online without having an idea of what it would look like on your skin. 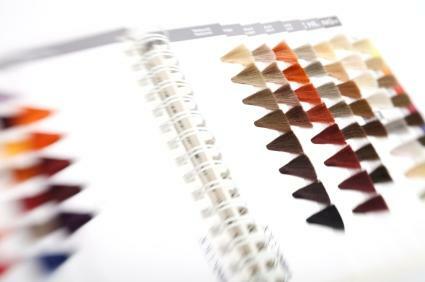 Color charts are necessary as reference points when deciding upon your new hair color. If you've ever scoured the hair color aisle in any major supermarket or beauty supply store, you've most likely seen a swatch guide filled with confusing numbers and alluring names to define a color formula. These basic color charts may vary from company to company, but are all based on the same principles. To determine your natural hair level, you'll want to hold a swatch to the base of your scalp and compare the level of darkness to your own. When you find the appropriate level, you can begin dabbling in tonal families, which will vary the shade, warmth, and coolness of your color considerably. Using a chart of hair colors can help you find just the right shade without relying on pictures or graphics. By seeing real swatches of hair in the suggested colors and being able to view them next to your own locks under different lights, you can get a better idea of what will be your best hair color.